Someone in Sales promised something that will be hard to deliver. He doesn’t seem to care how it impacts your department. What should you say? You have a request for someone in IT, but you don’t know how to say it, so . . . you don’t say anything. A project you worked on for six months has become a black hole. There is no information about the status. You’re frustrated but . . . you don’t say anything. One of your customers has unreasonable expectations. How do you say no, without saying no? One of your colleagues isn’t pulling her weight. It’s impacting you, but . . . you don’t say anything. Speaking up when we are frustrated is hard and as a result, most of us don’t. Instead, either we tell other people (aka gossip) or we say nothing and relationships become tense and explode. Establish trust in any relationship, laying the foundation to be able to address issues when they arise. Set expectations with co-workers, direct supervisors and clients – paving the way to successful long term relationships. Determine what’s important to your manager, co-workers and clients making it more likely that you give them what they need. 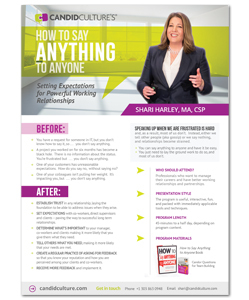 Create a regular practice of asking for feedback so that you know your reputation and how you are perceived among your clients and co-workers. Professionals who want to work, live and play well with others. The program is interactive, fun, relevant and packed with immediately applicable tools and techniques. 60-minutes to a full day, depending on program content.